Leadership assumes tension. All tension is not necessarily bad. Brad Lomenick shares ten thoughts on tension and how to manage these tensions. 1. Tension is a powerful platform to clarify what is important. Out of tension many times comes change. Change for good. 2. There is a constant tension between who I am and who God wants me to be. The tension of growth and maturity is always present. 3. Resisting average creates tension. Striving for excellence creates tension. 4. We constantly live with a tension of determining in life how much we give away. Whether it is time, money, talents, resources, or focus, leaders must understand and embrace this tension of generosity. 5. Generational tension is essential in passing the mantle of leadership. For the Church to move forward in culture, older leaders must pass on their wisdom and legacy to younger leaders. 6. Tension among and within a team is healthy. Unity doesn't mean there's no tension. Unity means you are pursuing the same mission in the midst of real and purposeful tension. 7. Leaders lead in the fray. Leading in the safety zone is easy, but true leadership happens in the fray where change is happening, and there is a unique tug of war happening in that area. 8. Typically, where there is no tension, there is no real growth. Tension builds courage, character, wisdom and makes us authentic and real. It stretches and motivates us. 9. 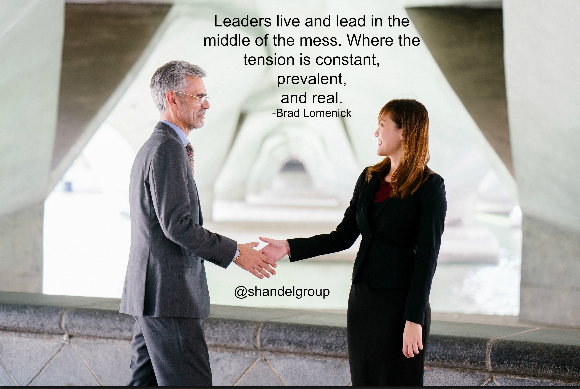 As a leader, lean into the tension that constantly exist. As Andy Stanley says, some tensions are meant to be managed, not removed or extinguished. 10. Tension is necessary. The tension makes us strong. Ultimately, the tension is good.